Britain's royal couple celebrated the 250th anniversary of the Royal Botanic Gardens at Kew on Tuesday, May 5th, planting trees much as they did a half-century ago. 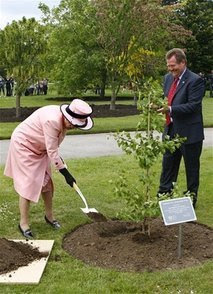 Dressed in a pink coat and matching hat, the 82-year-old queen wielded a shovel, heaving dirt at the base of a newly planted Ginkgo tree, while Tony Kirkham, the head of the Arboretum, looked on. * New topic: Queen plants Ginkgo tree at Kew, London, UK. Spring 2009: Ovules (seeds) on male Ginkgo tree with female branch. This tree was planted in 1785 from seed taken from Deshima by Carl-Peter Thunberg. I made this video in Hortus Botanicus Leiden - the Netherlands. April 25th, 2009. Click on HQ for better quality.